As always, my only nag in the race is America and as you know, in Mundane Astrology the Moon represents The Public whose favor and approval can fluctuate in the blink of an eye. So with the fast approaching Republican and Democratic National Conventions in July 2016, let's track the Moon through her zodiacal signs during the party nomination processes searching for lunar clues concerning public mood, sentiment, and popular trends in relation to Campaign 2016 and the presidential nominees who, here in late May, seem to be pre-selected. For both events you see expansive Jupiter conjoining fixed star Denebola (21Virgo) with key words: out of the mainstream; to go against society which shows 'the outsider' quality of this election, a requirement of Venus as Evening Star, and one which can be satisfied by a victory for Hillary Clinton (a female), Bernie Sanders (a Democratic Socialist and Independent), or Donald Trump (a self-declared non-politician). First up are the Republicans: RNC July 18--21, 2016 (Cleveland, Ohio). (For the DNC July 25--28, 2016 Philadelphia, Pennsylvania, see below). Besides the Capricorn Full Moon of Tuesday July 19th, a few other lunar events and aspects will be briefly mentioned as we sail through the signs with Luna, the astrological significator of emotions, feelings, needs, trends, publicity, and popularity. For the time frame, we're symbolically using the first day of each convention at 12:00 am until the last day of each convention at 11:59 pm--to represent each event in its entirety and to cover all possible signs of the Moon from start to finish. The 'last day' 11:00 pm charts are shown, below. 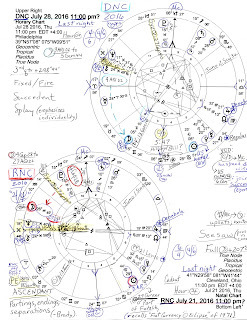 Note that the Sun remains in Cancer during the RNC and in Leo during the DNC, with Cancer ruled by the Moon, Leo ruled by the Sun; brief notes on the changing Sun-Moon blends are included as well as the Pre-Natal Solar Eclipse (18 South) which influences both conventions with 'separations, endings, partings' vibes. RNC 2016: Monday July 18th 12:00 am: the Moon begins @4Cap28 (Sun 25Can57) giving the public at home and in the audience a serious tone of ambition and practicality with duties taken seriously (Capricorn is the sign of government, law, and business; tribal Cancer denotes home but also business); a Moon-Saturn tone indicates that some frigidity of feeling may be in evidence, if not onstage or in the audience, then behind the curtain. Monday July 18th also contains a Moon-Pluto flavor as the Moon conjoins transit Pluto at 9:24 pm (15Cap56). In Politics, a Moon-Pluto signature describes potentials for the misuse of resources in business and/or political activities, and/or campaign promises concerning the use of the military and/or police, plus, underworld criminal elements such as mobsters, fraud, waste, women's issues, and/or hidden wealth (Munkasey); (Cowell). Actually, across the Cancer-Capricorn security axis, a doubling of Moon-Pluto vibes occurs on July 19th for a Full Moon @27Cap40 perfects and conjoins US natal Pluto (27Cap33) suggesting potentials for military and/or police involvement during the convention (or rhetoric about such topics), violence and/or criminal behavior, terrorism, paid protesters disrupting events, intense emotions such as rage or jealousy, hurled insults, hidden string-pulling, mass media and a very large amount of publicity. (Moon-Pluto = public relations; mass propaganda; a need for power.) Plus, with Moon-Pluto, a 'demanding tyrant' may be on the scene. This is supported by transit Pluto in Saturn-ruled Capricorn which can express as The Dictator (Ebertin). That the Full Moon's Sun opposes US natal Pluto @27Cap33 (and US SP Pluto @29Cap, a critical degree) hints at what we know to be the case: major power plays are in progress. The July 19th Full Moon may potentially reveal secrets much as a Lunar Eclipse can do and may involve the Pentagon and/or may place plutocrats (Pluto) in the public spotlight, and highlight misogyny, point to abortion issues, and/or uncover past abuses of women. Simultaneously, transit Pluto squares US natal Saturn (14Lib48), a time when motives must be aboveboard, and restriction and criticism occur due to our government's ruthless abuse of power and authority. Once the Moon enters Aquarius on July 19th (11:10 pm edt), convention vibes morph into a misty Water-Air blend of Sun Cancer-Moon Aquarius, a more visionary combination of energies. Yet heart and head may be at odds with this blend along with an urge to 'upset the apple cart', as they say. Yet there is warmth of feeling here along with interests in home, family, and ancestral heritage, plus, an ability to practice Politics by what can be described as "a people person" (Harveys). Reaching out to the public and the forceful communication of ideas with passion and conviction are notable. Gregarious yet private, this blend allows a continual redefining of the personality and integrity along with a talent for creating magic for or upon the public. By July 21st, the last night of RNC 2016, the Sun reaches the critical 29th degree of Cancer (+45m) spotlighting its interesting Sabian Symbol (when rounded up to '30Cancer'): "A Daughter of the American Revolution" = GLORIFICATION OF THE PAST (Rudhyar). The Republican Party certainly is determined on that even though it's an irrational head-against-brick-wall effort since the Great Cosmic Clock cannot be turned back to the 1850s or the 1950s! However, Mr. Trump's slogan, Make America Great Again, implies a link to our country's past and fits this symbol quite well. Of course, I assume that the RNC will not 'steal' the nomination from him by July! Additionally on the evening of July 21st, America experiences a Lunar Return @27AQ at 11:36:19 pm edt which underscores our natal lunar aspects of July 4, 1776 (past history!) and the Thor's Hammer pattern (aka, a Fist of God) in our natal chart (I use 5:09 pm LMT with 12Sag rising, Jupiter ruling) with the Sun-Saturn square at its base (Cancer to Libra) pointing toward our natal Moon (We the People). My reading is that the Sun-Saturn square represents the three branches of government: Sun = the president, Saturn = lawmakers (Congress) and law interpreters (SCOTUS) with the power of the executive branch restricted (square = blockage) by the other branches--and vice versa. That's our founding checks'n'balances tradition, at least, before anti-government infiltrators meddled and the White House under Bush-Cheney wrongly engaged in preemptive war, among other unlawful things. In some cases, President Obama may have overstepped his bounds, too. So! RNC 2016 is cosmically emphasized by a Capricorn Full Moon and a US Lunar Return, its dates possibly chosen for these planetary reasons. And it seems significant that Donald Trump announced his presidential bid on June 16, 2015 under the auspices of a New Moon @25Gemini07 (a new cycle of activity for him) and his political endeavor may culminate or pay off under the RNC Full Moon in Capricorn with the RNC's intense Moon-Pluto flavors of passion and possibly of violence. Now the Gemini-to-Capricorn lunations may be only a quixotic notion of his (or of mine!) but his 'Announcement New Moon' of The Messenger, Gemini (sign of his natal Sun, North Node, and Uranus), certainly seems about to bear Oval Office fruit--or at least provide the Big Opportunity for Mr. Trump's enlarged ego to pick a ripe one with his very own tiny little hands. History of The Republican Party. Now we mosey to Philadelphia where DNC 2016 begins Monday July 25th (12:00 am edt through Thursday July 28th 11:59 pm edt) with the Sun in early Leo (conjunct President Obama's natal Mercury--he will speak at DNC, of course) and the ever-changing Moon @9Aries02. 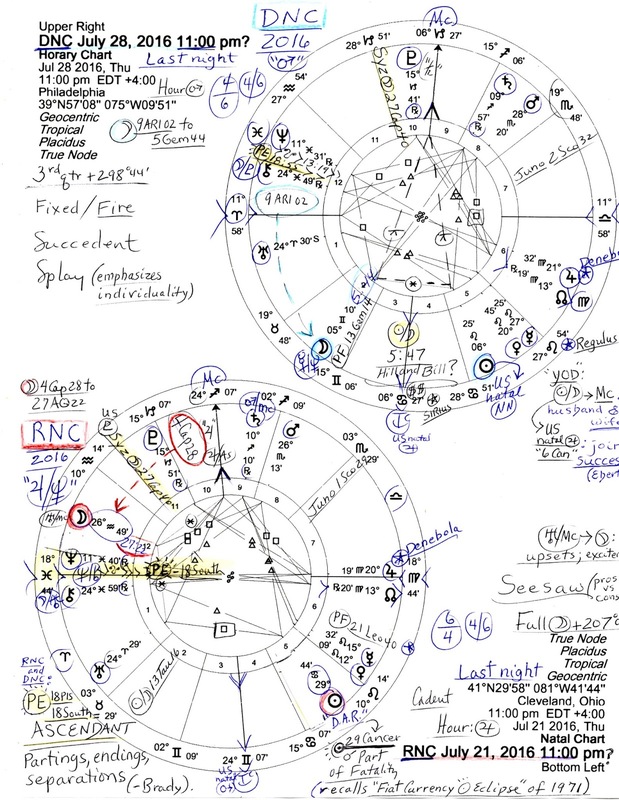 Note that Aries is Bernie Sanders' natal Moon sign though it could possibly be Hillary Clinton's Moon sign, too, if her birth time is later than advertised. Interesting that the Moon will soon contact '11 Aries' which in Sabian Symbols is, "The Ruler of a Nation" (Rudhyar) or "The President of the Country" (Jones). For public sentiment, Moon in Mars-ruled Aries indicates an eager mood of impulsive or stirred up emotions and excited women. And we may hear Hillary bring up the "I am one of you with my modest beginnings" assertion though to me it sounds more sincere coming from Brooklyn-ite Bernie Sanders. Tuesday July 26th: at 11:37 am, the Moon leaves Aries and enters Venus-ruled Taurus, its sign of exaltation, then on Wednesday July 27th at 9:55 pm, Luna will return to natal degree of former President Bill Clinton (20Tau18), a Lunar Return--with Jupiter trining his Moon along with Pluto so that a practical Earth Grand Trine is formed indicating a comforting power of attraction. This trine is a closed circuit of energies and hints at 'powerful builders' on the material plane, those who can consolidate vast resources until solid gains are made (Tierney). Yet the course of the Moon (reigning need - Tyl) has obstacles in its path via two squares from Mercury @25Leo44 (5A26) and Venus @10Leo28 (0A49) indicating conflicting opinions (Mercury) and a need to adopt another's perspectives (Venus) which I read as Hillary's adoption (in her rhetoric, at least) of the more progressive views of Senator Bernie Sanders. To hear very clearly another candidate's perspectives which political pundits say are causing Hillary to lean Left, check out the rousing speech of Bernie Sanders at his Bakersfield, California rally on May 28, 2016. And of course, Mercury represents young people (such as Millennial voters who prefer Senator Sanders in great numbers) and/or students of student loan fame. Lady Venus on one level may represent women or people involved in professions such as entertainment or the beauty industry, or who work in financial and/or teaching fields. 'If' Hillary is the nominee, she'll need to make some adjustments in her campaign promises which is supported or triggered by the chart's Moon phase of 3rd quarter, the crisis in consciousness phase. Monday July 25th: Sun Leo-Moon Aries (Fire-Fire): passionate, ambitious, dictatorial, a social conscience yet self-centered; adventurous, extroverted, a daring gambler, wants to improve things and takes charge. Cautions are to avoid grandiosity, rashness, and recklessness. (This blend may describe the environment on the first day and/or someone who takes charge of the proceedings, possibly DNC Chair Debbie Wasserman-Schultz). Tuesday July 26th -- Wednesday July 27th: Sun Leo-Moon Taurus (Fire-Earth): a showman, regal, dictatorial, loyal yet self-seeking, magnetic, generous, powerseeking, a good administrator, intensely stubborn, self-confident with a "splashy personality," reliable, sincere and courageous, shrewdly commercial, a big thinker. Cautions are vanity, inflexibility, subjectivity, and a lack of cooperation. Thursday July 28th: Sun Leo-Moon Gemini (Fire-Air): humorous, analytical, restless, sociable, organizing skills, youthful, purposeful yet playful, ambitious, adaptable, a quick learner, intuitive, friendly, quick witted, perennial student, persuasive communicator with a social conscience, an optimistic opportunist. Cautions are restlessness, emotional fickleness, and a tendency to over-rationalize. Mask off! For Sun Leo-Moon Gemini is the natal personality blend of Barack Obama! And he has a Moon Return (3Gemini) during the last day of DNC 2016. Now you see in the DNC chart a 'YOD pattern' as long as we're willing to count the Midheaven (MC, the Goal/Career Point @6Cap27) as the place where the Sun-Moon sextile (60 degr) at its base can express (in Career). At the Sun-Moon midpoint conjunct the IC, I wrote, "Sun-Moon = Hill and Bill?" because I think it does represent them and their marriage, a partnership of power. Also at IC is US natal Jupiter @6Cancer with its telling Sabian Symbol, "Game Birds Feathering Their Nests", a word picture from 1776 speaks for itself, agreed? Say what you will about the Clintons returning to the White House with all their tiresome baggage (that the GOP will never shut up about), since leaving the White House in January 2001, their speaking careers and the Clinton Foundation have been very lucrative for them and their family. Now on the right side of the chart you see my scribbles of "YOD: Sun-Moon = MC: husband and wife, and Sun-Moon = US natal Jupiter: joint success" (Ebertin), with a YOD denoting 'a special task, turning point, or crossroads' within this midpoint picture. Return of the Power Couple is apparently the Clintons' goal. The question of a crime syndicate coming along with them is beyond the scope of this post--besides the US is infested with criminal syndicates already. However, I consider the two political parties as factions of a ruling elite with each group determined to control the American branch of Global Government, and it will probably make little if any difference to the fate of the American people whether a Republican or a Democrat is selected by higher-ups to steer our sinking ship, the military arm of said Government. As for the upcoming transfer of power, a clue is found via the transiting Saturn-Neptune midpoint (26Cap+) now conjoining US natal Pluto which sits atop the Inauguration 2017 horoscope with potentials for feeling downtrodden (Tyl), and denials of guilt from responsible parties (Munkasey). Now there are two societal conditions that need serious addressing but will the new boss be same as the old? Yes, unless it's President Bernie Sanders. But how many sold-out politicians do you think would cooperate with him? In closing, I want to say that whoever moves into the Venusian Oval Office on January 20, 2017, the opposite party should consider one thing--that all their sore-loser criticisms and undermining of the presidency simultaneously undermines the United States of America. So as was not done during the presidency of Barack Obama, please think thrice before you determine upon our national failure because your treason is showing. History of The Democratic Party. Related posts: a few brief astro-notes concerning RNC Chairman Reince Priebus; Trump and Gingrich: Peter Pan and the Pied Piper; The Venus Cycle and US Presidential Election 2016; and 19 North Solar Eclipse Affects Election 2016 and Inauguration 2017.